Flat. Calm. Smoke rises vertically. Ripples without crests. Wind motion visible in smoke. Small wavelets. Crests of glassy appearance, not breaking Wind felt on exposed skin. Leaves rustle. Large wavelets. Crests begin to break; scattered whitecaps Leaves and smaller twigs in constant motion. Small waves. Dust and loose paper raised. Small branches begin to move. Moderate (1.2 m) longer waves. Some foam and spray. Branches of a moderate size move. Small trees begin to sway. Large waves with foam crests and some spray. Large branches in motion. Whistling heard in overhead wires. Umbrella use becomes difficult. Empty plastic garbage cans tip over. Sea heaps up and foam begins to streak. Whole trees in motion. Effort needed to walk against the wind. Swaying of skyscrapers may be felt, especially by people on upper floors. 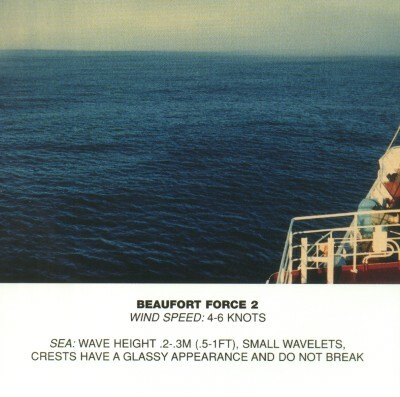 Moderately high waves with breaking crests forming spindrift. Streaks of foam. Twigs broken from trees. Cars veer on road. 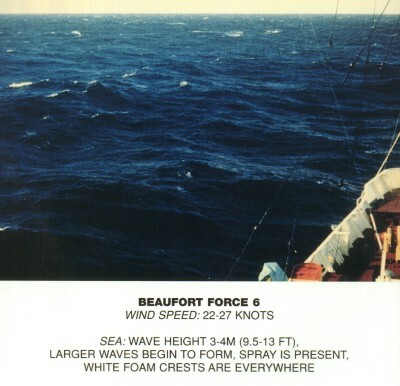 High waves (6-7 m) with dense foam. Wave crests start to roll over. Considerable spray. Larger branches break off trees, and some small trees blow over. Construction/temporary signs and barricades blow over. Damage to circus tents and canopies. Very high waves. Large patches of foam from wave crests give the sea a white appearance. 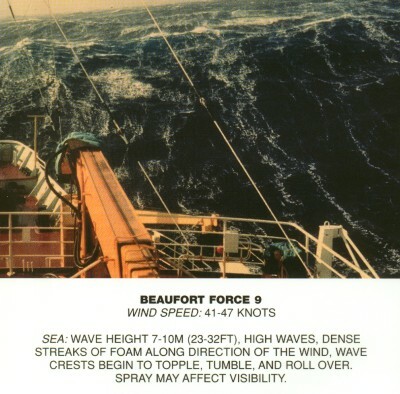 Considerable tumbling of waves with heavy impact. Large amounts of airborne spray reduce visibility. Trees are broken off or uprooted, saplings bent and deformed, poorly attached asphalt shingles and shingles in poor condition peel off roofs. Exceptionally high waves. Very large patches of foam, driven before the wind, cover much of the sea surface. 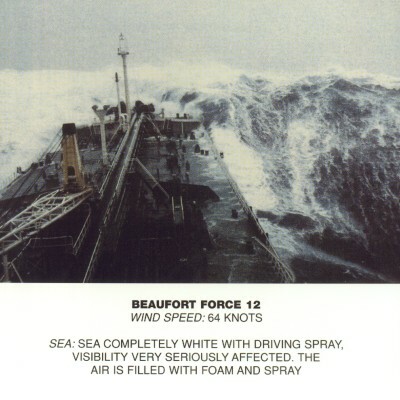 Very large amounts of airborne spray severely reduce visibility. Widespread vegetation damage. More damage to most roofing surfaces, asphalt tiles that have curled up and/or fractured due to age may break away completely. Huge waves. Sea is completely white with foam and spray. Air is filled with driving spray, greatly reducing visibility. Considerable and widespread damage to vegetation, a few windows broken, structural damage to mobile homes and poorly constructed sheds and barns. Debris may be hurled about.